US equity indexes closed broadly higher, sp +21pts at 2647. with the Dow +1.4%. The two leaders - Trans/R2K, settled higher by 2.0% and 0.1% respectively. 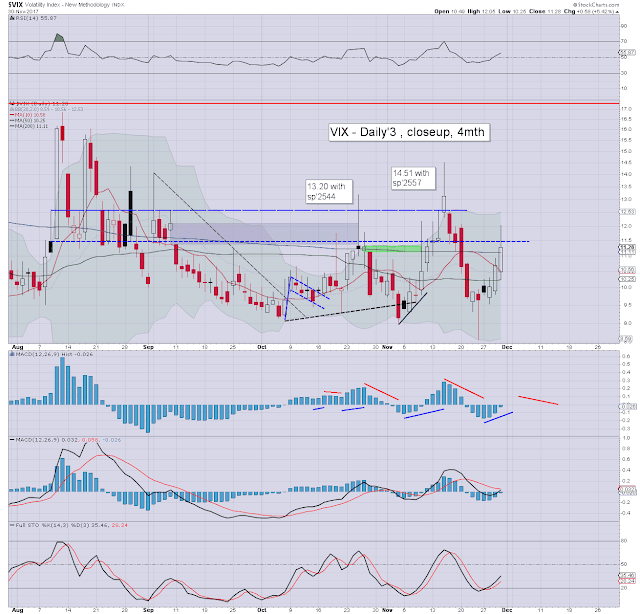 VIX settled +5.4% at 11.28. The m/t outlook remains powerfully bullish, and its notable that today's high of sp'2657 was a mere 26pts (1.0%) from my year end target of 2683. US equities opened moderately higher, and built rather significant gains into the afternoon, with a quintet of index historic highs: Dow, sp, nyse comp', R2K, and the Transports. 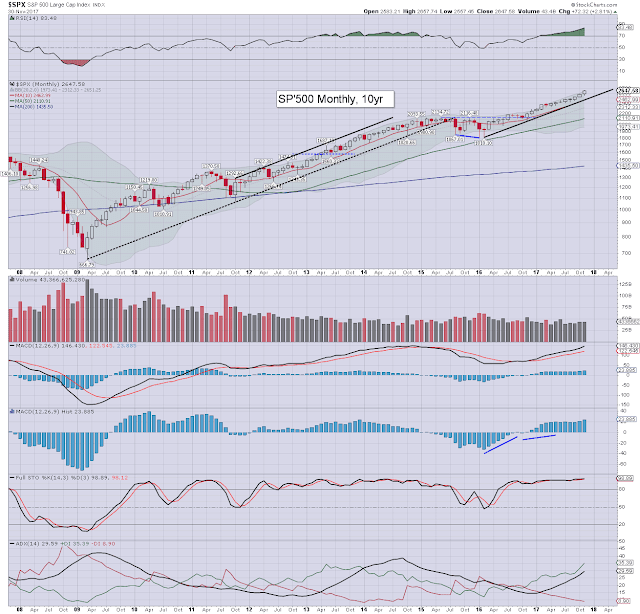 There was some latter day cooling from sp'2657 to '41, but having climbed 100pts across 11 trading days, it was a bullish end to the month. Despite equities breaking new highs, the VIX actually continued to claw upward, seeing an intra high of 12.05, and settling in the low 11s. It was notably the 5th daily gain of the past 6 sessions. We have five downside gaps in the sp'500, and normally those could be expected to fill. However, there are very decisive bullish breakouts in a number of key stocks, and its suggestive we won't even retrace to the 2600 threshold in the immediate term. 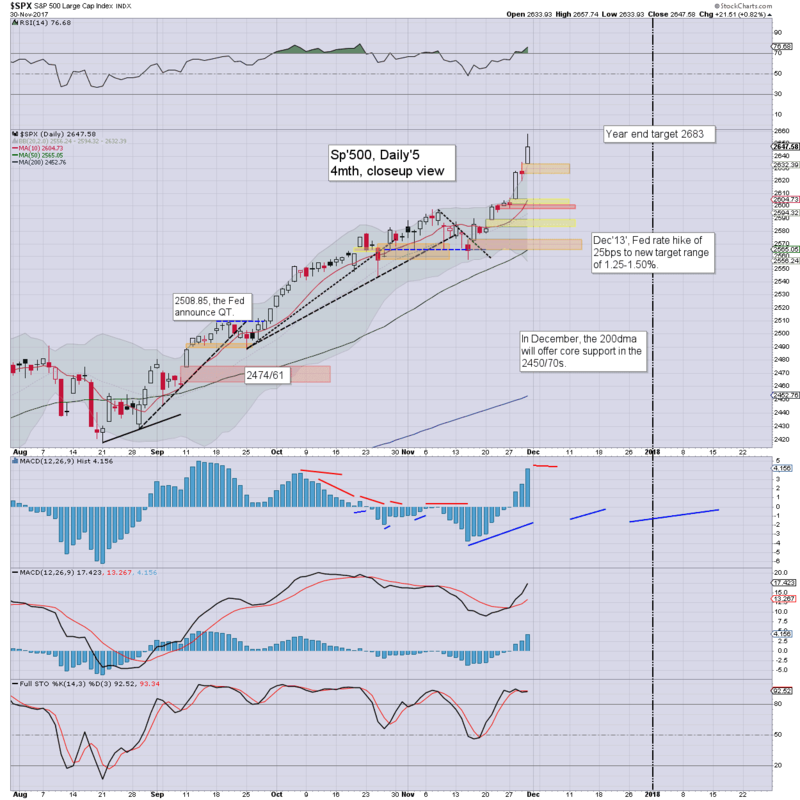 More broadly, the 2700s are now a viable target before year end. I recognise some will deem recent price action 'Euphoria', and will call (yet another) mid/long term top, but I'd argue they have no perspective, nor seem aware of price structure in the US or any other world equity market. 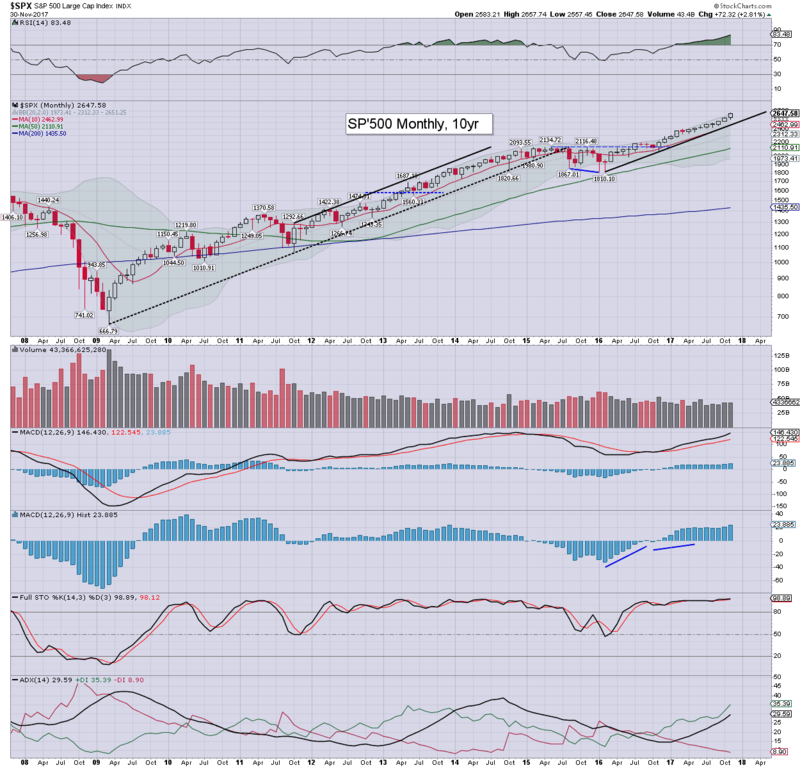 The sp'500 settled higher for an EIGHTH consecutive month, +72pts (2.8%) to 2647. The monthly RSI is now at 83, which is pretty astounding, and even higher than levels seen in 2013/14. ... and that is how November settled in my part of the world.